As mentioned in my review on Hotline Miami's soundtrack, Hotline Miami isn't the sort of game I'd usually go out of my way to play. While I don't shy away from playing violent games (e.g. Battlefield 4) I don't usually like playing games that glorify violence or where you're rewarded for smashing somebody's skull into a pulp. So I didn't go out of my way to buy Hotline Miami but eventually, I got my hands on it anyway thanks to my friend (and occasional contributor to this blog) Luke. Through a combination of Luke's encouragement and my weird guilt I tend to get with unplayed games on my Steam library, I decided to give it a shot. 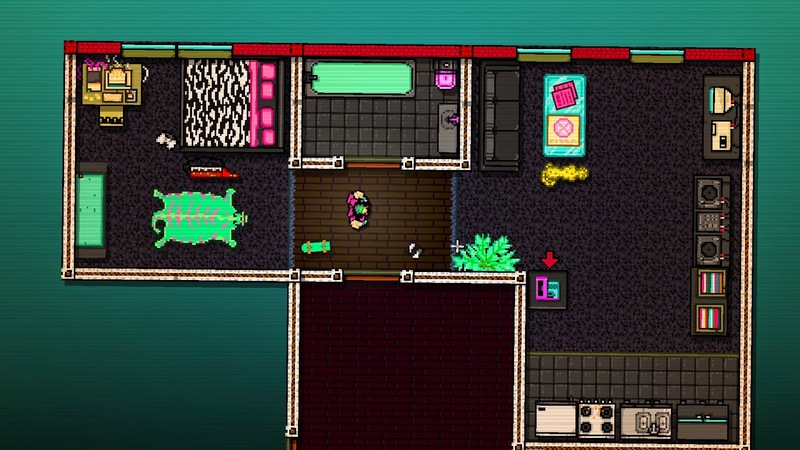 Hotline Miami is set in the late 80s in Miami, Florida - which makes it the fourth franchise I know of to be set during that time and place (the other three being the TV series Miami Vice, the computer game Vice City and the movie Scarface). Out of the three previous franchises, I think Hotline Miami has more in common with Scarface due to the sheer brutality in both the movie and this game, not to mention the screwed up nature of the protagonist. So who is the protagonist? 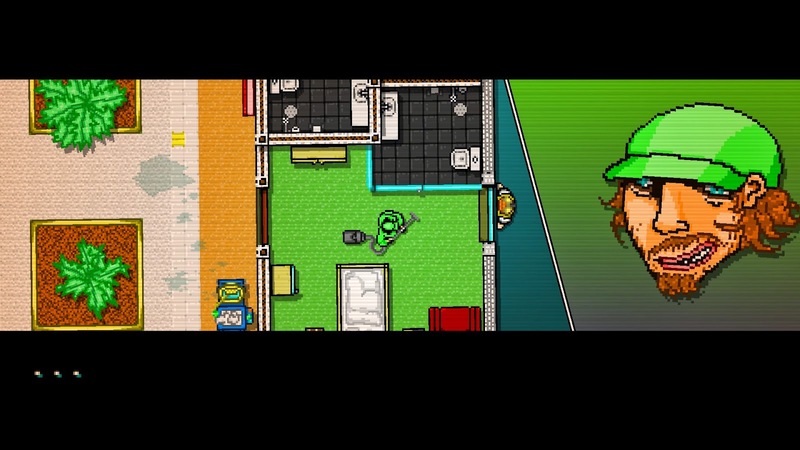 Hotline Miami can best be described as Grand Theft Auto with added stealth and puzzle elements. As you already probably know, I'm not a big fan of the GTA series so its the stealth and puzzle elements that I find most enjoyable in this game. The game consists of a number of multiple levels set in various locations such as apartments, discos, and video arcades. The GTA element of the game involves you killing everyone you meet at these locations and being rewarded points for doing so. Killing multiple enemies quickly or in creative ways will reward you with even more points. You also get a variety of weapons to use such as shotguns, assault rifles, pistols, knives, baseball bats, and several more (more than 30 I believe). Now you can attempt to finish every level using the gung-ho, guns blazing approach, but usually it will get you killed really quick since if you're hit only once by the enemy, you're dead and you'll have to start the level again. So unless you've got exceptional aim and super reflexes, you'll actually have to plan your attacks properly. Not only that, but usually adopting a silent, stealthy approach (i.e. subduing enemies without the use of noisy weapons like shotguns) will make your life easier. Of course, things don't always go to plan and you'll find yourself facing the "You're Dead! R to Restart!" screen many times - it's just as well there's a hotkey for restarting the game since you're going to be pressing it often! Despite me having to restart multiple times and cursing at the AI pathing on occasion, I was still compelled to keep on trying since every time I died I learned more about the level and consequently edged slightly closer towards my goal. There's going to be a lot of trial and error and reliance on lightning reflexes when you play this game, so if you don't like those sort of games, Hotline Miami might not be for you, but if you don't mind persevering, it can be quite satisfying completing a level. There's no voice acting in the game and the sound effects are pretty lo-fi (or retro, depending on your views). The soundtrack received an 8/10 in my review thanks to the late 80s/early 90s synthpop that perfectly suits the game; it's also happens to be a great album to listen to on its own. Graphics in the game are very primitive, evoking an original Grand Theft Auto art style and hence looking like a game made in the 1990s. Nothing wrong with that if you appreciate the retro art style but the game isn't going to win any awards in this department. Despite the game's primitive graphics though, it is still noticeably violent. Some enemies will crawl around on the floor with half their limbs off, while others will have their skulls beaten to a pulp while Jacket has them pinned down. That's not even mentioning the cutscenes where you have dismembered heads with their brains falling out talking to you. Not one of the most pleasant aspects of the game especially when you realise you can't avoid it - everyone has to die. While I'm unlikely to ever replay Hotline Miami I'm amazed it has managed to captivate me long enough for me to finish the game. As mentioned, I don't usually like violent games but either I started to become desensitised to it or the other facets of the game were compelling me to keep venturing forth. The game has a whole bunch of Steam achievements to unlock and also comes with Steam Trading Cards. I didn't encounter any bugs while playing the game although I heard there can potentially be some issues with it due to the fact it's developed with an older version of Game Maker. I had an issue with another Game Maker game, Risk of Rain, with respect to audio but maybe my resolving the issue with that game has resulted in no issues with Hotline Miami. The over-the-top violence in Hotline Miami might turn those of you away who don't like violent games but if you're able to stomach it, you'll notice there's actually more to the game than meets the eye thanks to its stealth/puzzle elements. You'll need a combination of wits and lightning reflexes, and you'll often find yourself cursing at how frustrating the game is at times, but with great difficulty comes a great sense of achievement when completing the levels. Combine these qualities with an awesome soundtrack inspired by music from the 80s and 90s and you'll want to keep playing this game to the end. If you want to get the game, you can get it on Steam.